Micropor. Mesopor. Mater., 243, 85-90, (2017). Carbon dioxide capture requires stable porous solids like zirconium based metal-organic frameworks (MOFs) in order to make sequestration efforts feasible. 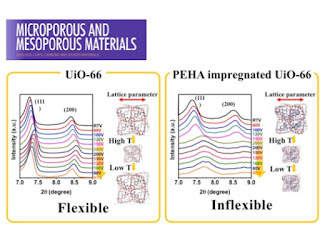 Because of the weak binding at low CO2 partial pressures, oligomeric amines are commonly loaded on porous supports to maximize CO2 capture while attempting to keep porosity for enhanced diffusion. 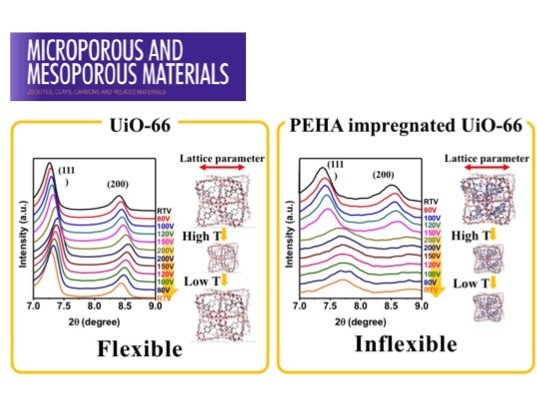 Here we show the first temperature resolved stability study of linear-amine impregnated UiO-66 by in-situ monitoring of the PXRD pattern. Our findings show that the crystal structure shows a contraction at temperatures as low as 80 °C and deforms considerably above 120 °C, leading to significant doubts about their applicability in CO2 capture from lean feeds. We confirm that all MOFs need to be thoroughly analyzed at least by means of PXRD at the process relevant temperatures, and reinforced before any plausible plans of application in CO2 capture.